The Unihertz Atom focuses on a niche audience, one that understands the shortcomings of such a form factor. If you can live with the small screen and don’t mind the short-ish battery life, then this rugged device is unbeatable. (Update: The Kickstarter page is now up and has already reached $376,000, collected from nearly 1,800 customers, with 34 days left. The original goal was only $50,000). 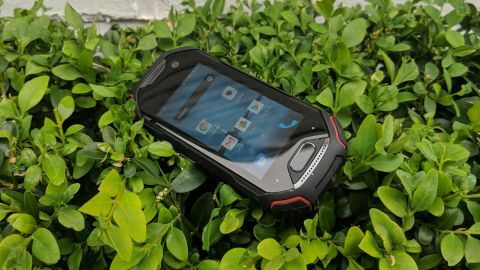 Today marks the launch of the Kickstarter campaign for the Unihertz Atom which is billed as the world’s smallest 4G rugged smartphone. It is the second attempt from Unihertz at a crowdfunded smartphone; the first try, Project Jelly, saw nearly 11,000 backers pledging more than $1.25 million (around £950,000). With Atom, the company is aiming for something even bigger. Unihertz sent us the review sample and the Atom is now on sale for $159 (£120) for the Super Early Bird (first 100) customers; the price will go up significantly, to $233 (£175), after the promotional period. The Kickstarter page is up here. Note that this price excludes delivery (shipping to the US, Japan, and most European countries is free, with the rest of the world costing $20) and any taxes that may be levied by HMRC or the courier companies on behalf of the vendor. Want to buy tech from online retailers? Read this first. Note that the estimated delivery date for the Unihertz Atom is October 2018, which is four months away at the time of writing. The unit that we were sent for testing was a production-grade model. The Atom is unlike any smartphone we’ve seen up until now – it is tiny (97 x 45 x 19mm) and weighs just over 100g. Think of it as a rugged smartphone that has been squashed and compressed into something stockier, which should, in theory, help it survive being dropped better. With rubber used all over its chassis, the Atom feels solid and durable. Where others would have used yellow lines to accentuate its rugged looks, Unihertz chose red as the accent color for the Atom. At the front of the device is a camera and three capacitive buttons, one of which also doubles as a fingerprint reader. A USB Type-C connector, an audio port (both not covered by any flaps), a dual nano-SIM tray, two volume buttons, a power button and a dedicated push-to-talk button can be found on the four sides of the Atom. The back – which is textured – hosts another camera with flash, a speaker grill and the Unihertz logo. There’s also a notch that can be used to attach accessories or a neckband. The device has been IP68-certified which means that it has been tested and should easily withstand life outdoors, and be capable of dealing with its fair share of water, dust, shock, vibration and extreme temperatures. Despite its low price, the Atom is kitted out with components usually found on mid-range handsets: an 8-core CPU, 4GB of RAM and 64GB on-board storage. There’s no microSD card slot, though, and no 802.11ac Wi-Fi. The screen is a 2.45-inch display, offering around a quarter of the surface area of a device like the Vernee Active (with a 5-inch display). The difference is even more obvious when it comes to sheer resolution: a Full HD display has 21x more pixels to manage compared to the 99,360 pixels on the Atom’s screen. The 2Ah battery is powered by a 5V,1.5A power supply unit. The battery was one of the compromises that had to be made because of the limited space available in this handset. Unihertz plans to follow GoHero’s example and offer a few accessories for outdoorsy types. Three will be available to begin with: an armband for $13 (£10), a bike mount costing $15 (£11) and a clip priced at $12 (£9), or it’s $20 (£15) for all three when purchased with the Atom. The small size and low resolution of the display means the GPU on the Atom didn’t have to work as hard as other handsets. That helps explain why it managed to significantly outperform many other rugged smartphones that are powered by similar system-on-chip solutions. The screen – which is oleophobic and covered with Corning Gorilla Glass – has its own issues, all associated with its small size. It is usable but don’t expect the same level of comfort as a bigger model – on the default setting, the text is absolutely tiny and will strain your eyes, especially if you wear glasses. Starting and swiping apps works okay but typing on-screen is a proper hassle with keys on the virtual keyboard that are just a few square millimeters in size. Writing emails or typing on WhatsApp will be a major pain, you have been warned! It’s all not bad though. We were surprised to find that the Atom is powered by the very latest version of Google’s mobile operating system, Android 8.1 (Oreo), and that it even comes with NFC and face unlock. There’s also a toolbox that comes with a sound meter, a compass, a bubble line, a picture hanging app, a heart rate measuring app, a plumb bob and a protractor. One thing we did notice is while the small screen will help save juice, the smaller battery capacity translates into a much shorter usable battery life, as the components used here are still standard ones. The Atom has no real rival: it is the only 4G smartphone of this size, and it is by far the cheapest IP68 device with the popular 4GB/64GB of memory/storage combination. We had mixed feelings about the Unihertz Atom. On the one hand, it is very affordable, quite compact and very capable. And on the other hand, the small battery capacity and the screen size and resolution just do not feel right. You won’t be able to use it for most tasks that require typing. That said, it will appeal to outdoor users, and we can foresee use cases where the device will be used with a plethora of accessories to address its shortcomings: laptop docking stations, Bluetooth headsets etc. For now, we’d love to see Unihertz try its hand at a more conventional form factor. A 4-inch Android IP68 device maybe? One to replace the likes of the Sony Z5 Compact.